If you ever find yourself in Japan, attending a Takarazuka show might be something you wouldn’t think of first. Maybe you have never heard of this theater troupe, maybe you are more concerned with popular culture, and maybe when you are into high arts, you think about visiting a Kabuki or No performance. The nice thing is that Takarazuka blends all of these interests and more. Takarazuka Revue was founded by Ichizo Kobayashi, an enterpreneur that also started Hankyu, the railway company that also has tons of stores and other corporations. He figured that travelers needed entertainment and near an Onsen, he founded an all-female show choir in 1914. Not much later, he founded a school to train the girls to be great performers. 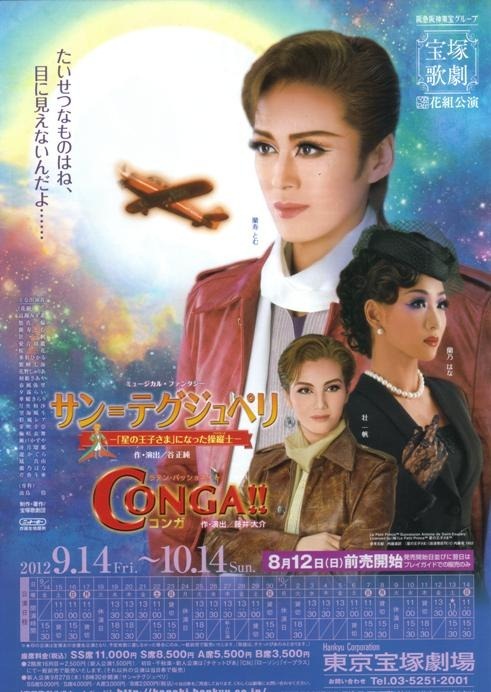 By now, Takarazuka is huge and meets much critical acclaim. However, getting access to the school or the performers is difficult. There are only a handful of good Western accounts of the group and even Japanese research on it seems limited. Jennifer Robertson wrote a great ethnographic book on Takarazuka and Dream Girls, a video documentary, has also met much acclaim, but I never got my hands on it. Though Takarazuka always kept its origins as a sing and dance group, it soon became a platform to communicate Western musicals to a Japanese audience (e.g. West-side Story, Elisabeth). The members also make their own original musicals and many adaptations of popular narratives (even games like Ace Attorney). Every musical is finished with a very elaborate, glittery, almost burlesque dance show. It will remind you of the Moulin Rouge but it will involve even more glitter and feathers than you presumed. Because of my interest in Japan’s popular culture and musicals, I became very interested in their shows years ago, but it was difficult to really become a fan because access to the material and its large legacy was near-impossible. However, this summer, I got a real taste of Takarazuka. I was finally going to see the flower troupe perform! 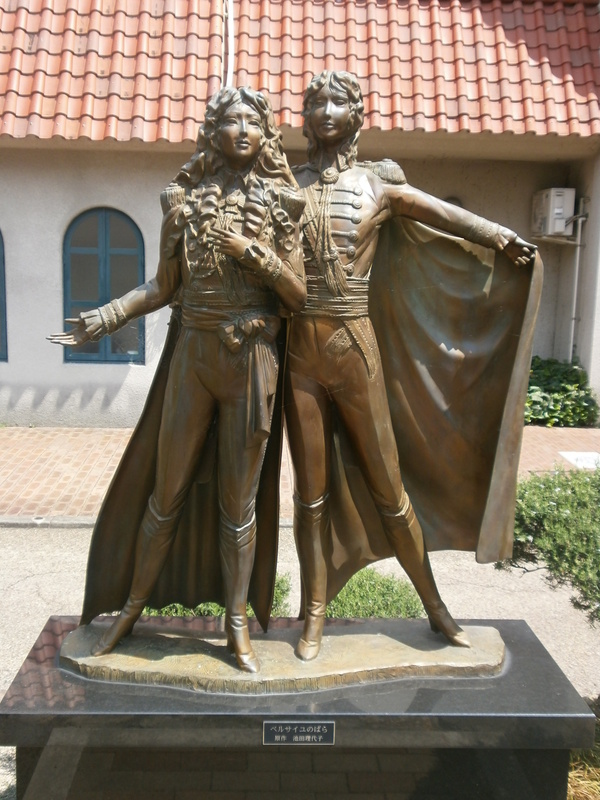 When I walked to the Takarazuka Grand Theater over the beautiful ‘Flower Road’, with little benches and rose pedastals, I was met with a statue of Rose of Versailles and couldn’t help smiling. I passed many shops and even simple pharmecies and small restaurants sported pictures of Takarazuka stars of all times. Though Takarazuka is the birth place of the founder of manga, Osama Tezuka, its identity is mostly defined through Takarazuka Revue. 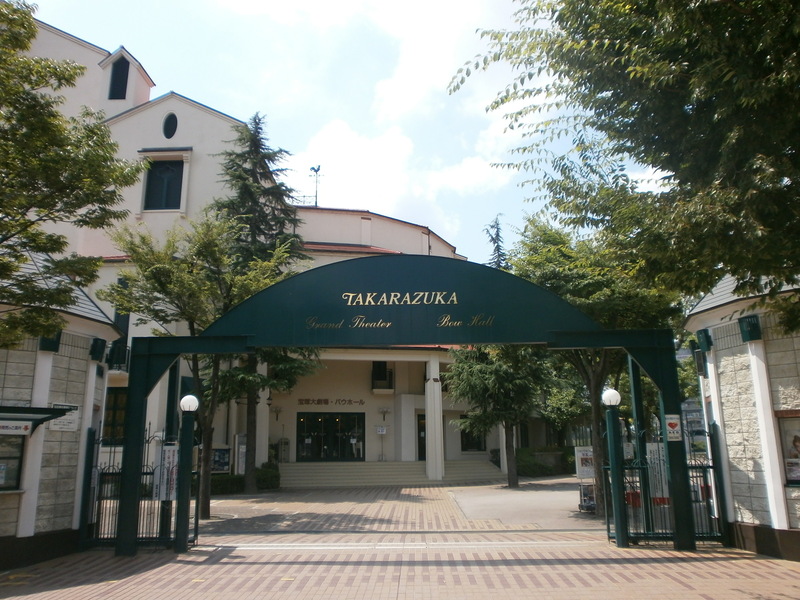 Takarazuka City, the complex around the theater, reminds one of Disney Land’s Main Street buildings. It is very different from Takarazuka’s other big theater in Tokyo, which is very modern and squeezed between other event buildings in Ginza. Going to Takarazuka itself means going to the heart of this troupe and its European-inspired imaginations. Saint-Exupery tells the life story of the famous author of The Little Prince, Antoine de Saint-Exupery. Historically, he is clouded with many myths since, as a pilot, he was lost at sea three weeks before Paris was liberated in 1944. The musical introduces him through a German reporter, anxious to find out what happened to ‘Saint-Ex’ in 1945. His story is shared. Above all, his marriage to Consuelo, from El Salvador, is given much attention. This romance is also used to juxtapose French culture with Latin and Central American motives. This biographical musical also ties in the story of The Little Prince, which is very popular in Japan. After a crash, Saint-Ex wanders through the desert and, much like in the book, meets The Little Prince and tells his story. The writer, Daisuke Fujii, obviously did her research and manages to captivate the audience through these small, surreal scenes. Though this wasn’t their best work, the really good bits and top-notch decors made it very worthwhile. I was impressed by the Otoko-yaku, the women who performed men. It was quite amazing to behold this in real life and see how convincing their drag at some point was. Takarazuka has much of the oldest fan clubs in Japan, Jennifer Robertson explains in her book. The different troupes and even different actresses all have their own fanzines and memorabilia. The shops in Takarazuka City, notably Quatre Reve, reflect this. You can buy pictures of the different actresses, little posters and small keepsakes. Many women buy photographs to add to their collection or of the performance that they are attending. The most expensive are the CD’s and DVD’s, which they want to keep very exclusive. Live performances are emphasized this way, also by keeping the tickets very affordable. Like anywhere in Japan, many of the shops also specialize in Takarazuka omiyage (presents, often sweets). In the building, there are also several Salon de Takarazuka venues, where you can admire star pictures and old dresses and get a photoshopped picture taken with you and the stars. Though many fans and press will tell you that Takarazuka draws a largely female audience, I also saw many families and couples attending the show. I did not see much difference between the audience of Western musicals which also has more women attending than men. However, I did see many women in the stores collecting the pictures and dragging shopping bags and talking about the show. They seem more invested in Takarazuka in this sense and also in the celebrity culture and myths that are tied to the venue. In terms of celebrities, Takarazuka is really interesting because the women always have to keep up their image and stay single when they are in Takarazuka. They are expected to marry later on and have a normal, heterosexual life. Any connotations between dragging and lesbianism are kept off the press. In the lobby I saw a few interviews with some of the otoko-yaku and indeed, they still looked and behaved like men with low voices and relaxed attitudes. Interested? Here’s some things I noticed. – I went to Takarazuka in the vacation period and still got a ticket at the door. It seems it’s not always sold out. In the weekend, there are many shows, so there’s a chance you can still score a ticket. Convenient stores are another good and easy way to go (Lawson, for instance). – Amongst the hundred of Japanese, i only saw one other gaijin. Be prepared. – Don’t let the language barriere hinder you from enjoying the show. – The break is half an hour and there’s vending machines for affordable drinks and snacks. Yes, you can bring it into the theater as long as you don’t eat during the performance. Now that’s unexpected. – Be prepared that there’s one star (I think it’s always an otoko-yaku) that gets a lot of attention and also speeches afterwards. – Though the two main theaters are in Takarazuka and Tokyo, there can be shows in Osaka and Nagoya and elsewhere as well.